So, this one might not look as impressive, but so far, it’s been my favorite meal all year (well okay, maybe tied with the bacon wrapped filet). Yoinked straight from Pinterest, but with a few changes. The original post I pinned is here, in case you’re curious. I took the idea, but instead of using apples, I substituted with asian pears. The asian pear season is in FULL swing and our local orchard is churning them out almost as fast as the local population consumes them. They’re hugely popular around here, and you best get to the market early if you want a couple! Anyway, I cut slices in the pork loin, stuffed in slices of apples, and put it in the crock pot. 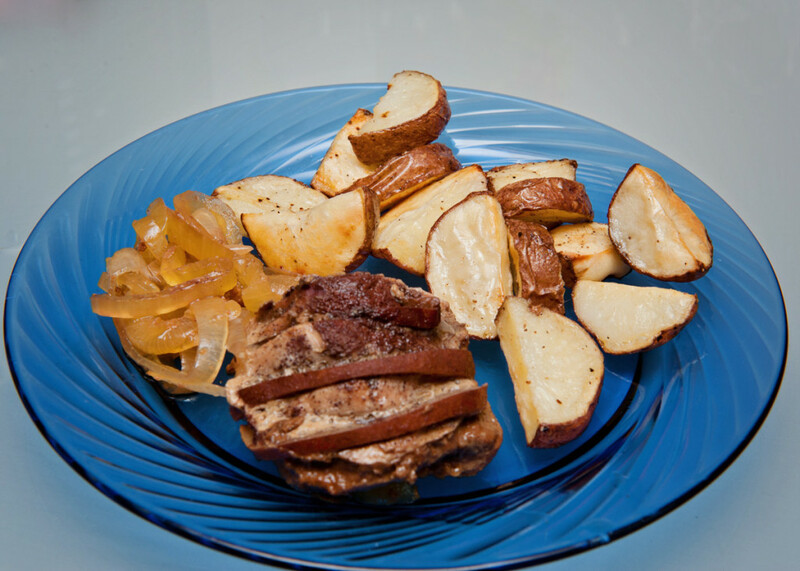 I covered the loin with a dusting of cinnamon and honey, added some asian pear cider in the bottom and onions on top. WOW. It came out so tender and just plain amazing. I may have to do this one again and try using other fruits. Add in some roasted potatoes instead of mashed, and we have a full meal on the plate.